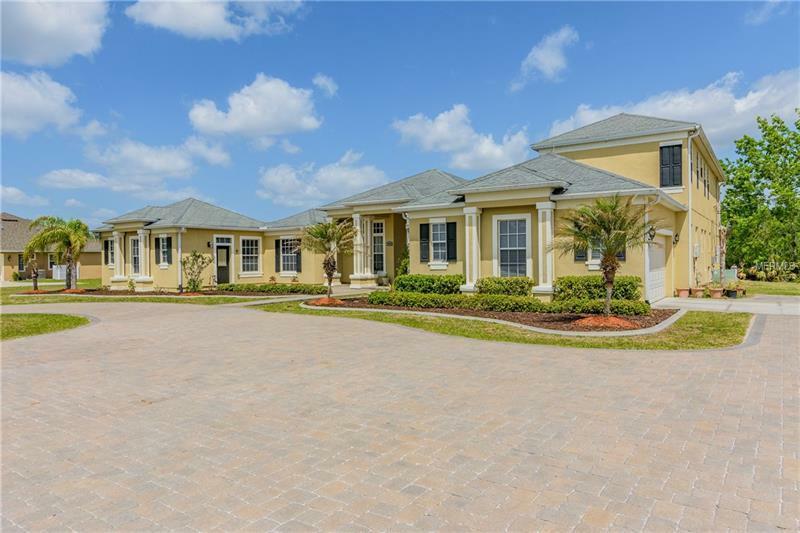 This custom built home is move-in-ready with 6 beds/5.5 baths 2-story home, offering an in-law apartment has a full kitchen with 42 inches cabinets, granite counter tops, all kitchen appliances included. The main house offers 2 car side-entry garage and a fully paved roundabout drive way to accommodate multiple cars. Located on a premium lot with over 1 acre of property! The expansive and open living area greets you upon entry to this 8 foot double entry glass door, first with the grand living room and dining room which features porcelain 20 X 20 tile throughout the entire first floor. Crown moldings, tray ceilings, round tapered architecture columns and sliding doors to the covered lanai open to the pool. The living room offers 20 foot high ceiling and the gourmet kitchen offers plenty of gorgeous granite counters including an island, all stainless steel appliances, upgraded kitchen cabinets, back splash, hood vent, and large walk-in pantry! The stunning master en-suite features a large hydro garden tub, dual sinks, separate walk-in shower and two large walk-in closets. This split floor plan offers lots of privacy. Second floor offering 2 additional bedrooms with 2 full baths fully upgraded with granite counters tops, lighting fixtures and hardwood flooring. Screened in Salt water pool and plenty of deck space to entertain family and friends. Equipped with Precast solid concrete walls, water softener and filter, and sentricon system for termite protection! Well water and solar panels make this home very affordable! Call today for your private viewing!